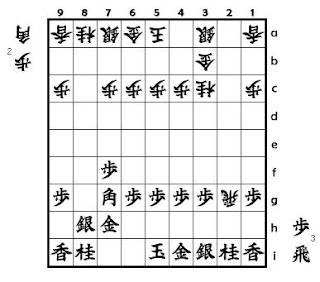 Yamajunn's Shogi opening traps: Yokofutori : NAITOU ryu San-San Kaku senpou : part 1. Yokofutori : NAITOU ryu San-San Kaku senpou : part 1. 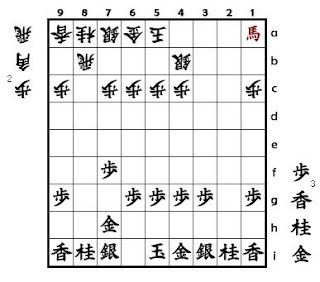 Shogi Opening traps : Yokofutori : NAITOU ryu San-San Kaku senpou : part 1. The diagram 1 is a typical starting of NAITOU ryu San-San Kaku senpou . 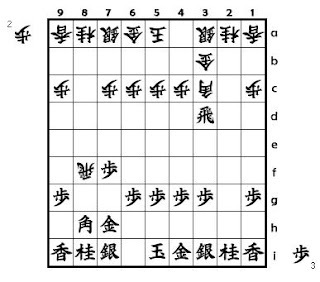 In diagram 1 , you may think Sente can get material advantage by following moves ; 9.Rx3c+ Nx3c , 10.B*7g . After Gote's Rook escapes (for example 10...R-8b) , Sente will move 11.Bx3c+ Gx3c , 12 Bx3c+ (diagram 1') . Whether Sente can get an advantage or not ? Gote doesn't escape his Rook , but exchanges it with Sente's 8h Bishop . And after the exchange , Gote can drop his Rook before Sente and gets a slight advantage . Then in many cases , Sente players move 9.R-3f .